This still from a NASA video shows the vast smoke plumes from raging wildfires in Colorado and other U.S. western states as the International Space Station soared overhead. Video released on June 28, 2012. The vast scale of wildfires raging across parts of Colorado and the western U.S. has been captured on camera by astronauts on the International Space Station. A video released by NASA today (June 28) shows huge plumes of smoke billowing up into an otherwise clear sky above the Rocky Mountains. Several fires have been burning nonstop in the region, including the out-of-control Waldo Canyon Fire that has consumed 15,517 acres (6,280 hectares) so far. 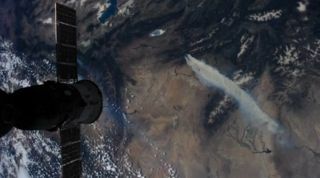 The high-definition video of the Colorado wildfires from space was taken through an Earth-facing window routinely used by the astronauts to observe their home planet. "The crew did have some time to shoot some photos and a video of the large Colorado wildfires that are raging in the Rocky Mountains," a NASA spokesman said during the space agency's daily mission commentary. "Earth observation is one of the very useful things that's available on the unique platform of the International Space Station." As of Wednesday (June 27), the Waldo Canyon fire was only 5 percent contained and had forced the evacuation of at least 32,000 people, NASA officials said. NASA has been keeping a close watch on the Colorado wildfires with satellite observations in addition to the sightings by space station astronauts. The International Space Station is currently home to six astronauts: Three Russians, two Americans and one Dutch spaceflyer. Three of the astronauts are due to return home Sunday (July 1) aboard a Russian Soyuz space capsule. The landing will mark the end of a months-long stay in orbit for the station crew. The returning astronauts are Don Pettit of NASA, Andre Kuipers of the European Space Agency, and Russian cosmonaut Oleg Kononenko, who currently serves as the station's Expedition 31 commander. The trio will be replaced by three new crewmembers scheduled to launch later in July. You can follow SPACE.com Managing Editor Tariq Malik on Twitter @tariqjmalik. We're also on Facebook & Google+.